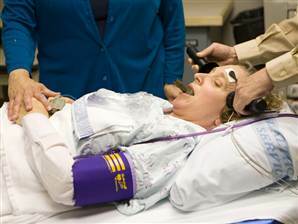 Electroconvulsive therapy is often considered a primary treatment option for patients with severe bipolar disorder that has resisted pharmacological treatment. Researcher Helle K. Schoeyen and colleagues recently published the first randomized controlled trial comparing ECT (in this case right unilateral brief pulse ECT) with algorithm-based pharmacological treatment in 76 patients with treatment-resistant bipolar depression. The response rate was significantly higher in the ECT group than in the patients who received drug treatment (73.9% versus 35.0%). However, the two treatment groups had similarly low remission rates (34.8% for ECT and 30.0% for pharmacological treatment). The algorithm-based pharmacological treatment used in the study was based on a sequence of treatments endorsed by researchers Frederick K. Goodwin and Kay Redfield Jamison in their 2007 book Manic-Depressive Illness. A selected treatment was chosen for each participant based on his or her medical history. If the first treatment was ineffective or intolerable, the patient would be switched to the next treatment option. Antipsychotics, antidepressants, anxiety-reducing drugs, and hypnotics were some of the other treatments included in the algorithms. Patients in the study had previously showed a lack of response to at least two different antidepressants and/or mood stabilizers with documented efficacy in bipolar disorder (lithium, lamotrigine, quetiapine, or olanzapine) in adequate doses for a period of 6 weeks (or until they quit because of side effects). Editor’s Note: Even when ECT is effective, there is the issue of how to maintain that good response. We previously reported that in a 2013 study by Axel Nordenskjöld et al. in the Journal of ECT, intensive followup treatment with right unilateral brief pulse ECT combined with pharmacotherapy was more effective than pharmacology alone at preventing relapses. Patients who improved after an acute series of ECT (three times/week) then received weekly ECT for six weeks and every two weeks thereafter, totaling 29 ECT treatments in one year. Other studies of more intermittent continuation ECT have not proved more effective than medication. Thus high intensity right unilateral brief pulse ECT is one option for extending the effects of successful ECT. Synthetic cathinones are not well understood, but a few studies published in the journal Neuropsychopharmacology this year provided some preliminary findings. 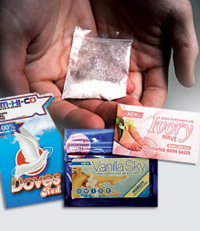 The most common synthetic cathinone found in the blood and urine of patients admitted to emergency rooms in the US after taking bath salts is 3,4-methylenedioxypyrovalerone, or MDPV. In a study of rats by Baumann et al., MDPV was found to have a strong blocking effect on uptake of the neurotransmitters dopamine and norepinephrine, while having only weak effects on uptake of serotonin. MDPV’s ability to inhibit the clearance of dopamine from cells is similar to cocaine’s actions, but MDPV is much more potent and effective at this. MDPV was also 10 times more potent than cocaine at producing physical symptoms in the rats, such as motor activation, tachycardia (irregular heart beat), and hypertension (high blood pressure). Another study of rats by Fantegrossi et al. found that rats that received MDPV experienced motor stimulation that was potentiated by being in a warm environment. When the rats received relatively high doses in this environment, they engaged in profound stereotypy (repetitive movement) and self-injurious behavior such as skin-picking or chest-biting. This study also found similarities in the internal effects of MDPV and MDMA (ecstasy) and methamphetamine. Synthetic marijuana, otherwise known as spice, skank, or K2, is not only vastly more potent than the tetrahydrocannabinol (THC) in marijuana plants, but it also lacks cannabidiol (CBD), the calming, antipsychotic substance also present in the plants. This makes spice much more likely to induce major psychiatric effects. New evidence links use of spice during pregnancy to a tragic birth defect, anencephaly, or absence of the cerebral cortex. It can also lead to the later development of attention-deficit hyperactivity disorder, learning disabilities, memory impairment, depression, and aggression. Effects of THC on gestation may occur as early as two weeks after conception, meaning by the time a woman realizes she is pregnant, the fetus may have been harmed by exposure to the drug. Other new finding associate use of spice with acute coronary syndrome and the kind of acute kidney injury that can lead to the organ shutting down. 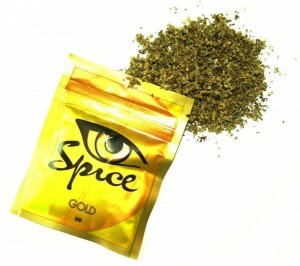 Editor’s Note: It has now been found that synthetic marijuana, or spice, can lead to psychosis, delirium, acute coronary syndrome (heart attack) in young people, and now kidney dysfunction, in addition to causing birth defects if used by pregnant women. Not only is spice made up of more potent THC without the calming effects of CBD, but it is often laced with unknown contaminants, which are likely the cause of the heart and kidney damage. Smoking regular marijuana is bad enough—it doubles the risk of psychosis and may precipitate the onset of schizophrenia. It may also cause long-lasting effects on cognitive function. Since many states are legalizing marijuana, it is important to know the risks. In any case the risks are much more serious with the synthetic product, and synthetic marijuana should be avoided at all costs.